You’ve booked a presentation and you’re beyond excited. You’ve got something to say. A message that you’ve been crafting for quite some time and finally you’ve got an audience to hear that message. Except you won’t rock it because you’ve fallen into the presentation gap. The gap is the difference between what you want to say and what the audience needs to hear from you. You’ve got an audience and do they need your message. But they are not showing up to hear what you want to tell them. They’ve got higher expectations. Sure, you’ve got your message. That’s great. I help my clients all the time build a core presentation they can go to different organizations and give that speech. The trick to knocking it out of the ballpark and delivering a presentation that creates a remarkable experience while giving the audience a transformation is customizing each presentation to each audience. This means that even if you’ve given your speech a million times, it should change (even slightly) for each different audiences. Then a long, deep sigh. But all was not lost! There were parts of his message that when spun with the right stories, crafted different takeaways, and gave up telling part of his story would totally resonate with this young crew. He just had to build the a bridge to traverse the gap of what he want to say and what his audience needed from him when they walked into that auditorium. Here’s how to do that by answering two questions. What problem or challenge can your presentation solve? When you’re booked as a speaker, you are booked for your expertise. The audience has a problem and they need the information swimming in your head. Whether it’s the first time you’re speaking or the 975th time, get focused on what challenge needs to be solved. And if you don’t know what the problem is that only you can solve? Ask the person who booked you for the gig. When I talk to a meeting planner, I spend a lot of time talking about how my message can help their audience (and make them look good in the process). How can you give the audience a bite-sized taste of what you can do? I love working in constraints otherwise my inner-innovator runs amuck. Most speakers try to solve all the problems of their audiences whether they are giving a 10, 20, 45, or 90 minute speech. The mantra is PRESENT ALL THE THINGS!! Except this is impossible to do (so please stop and for all things good in the world please stop overwhelming your audience with information…it’s not useful to them). What’s ONE (just one) problem you can solve for the audience completely so they can take the next step? Give them a complete experience and you’ll create so much value for them they will want more of what you can offer them. 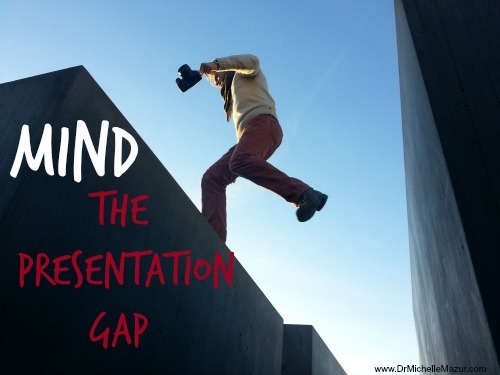 Creating a presentation that bridges the gap between your expertise and what the audience needs most is a surefire way NOT to fall into the abyss of audience alienation. When you stop focusing on “this-is-what-I-am-going-to-tell-them” and deliver on “this-is-what-this-audience-most-needs-from-me,” then your presentation is going to be a success, the audience will turn into advocates, and everyone will want more of what you can offer them.